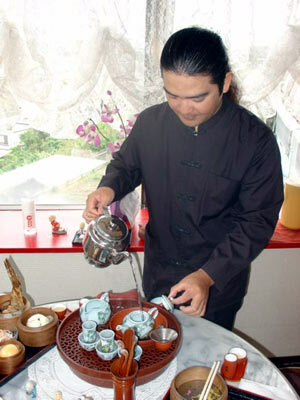 A tea ceremony is more than the American time honored tradition of dropping a Lipton tea bag into a cup and adding water. Asia’s cultures treat tea with near reverence, infusing both the preparation and sipping processes with tradition, deference and ceremony. On Okinawa, many opportunities are available to observe the Japanese custom, and often, to partake in the results. Chinese have their own, unique rituals on tea preparation and service which are equally fascinating, and the teas taste fantastic. 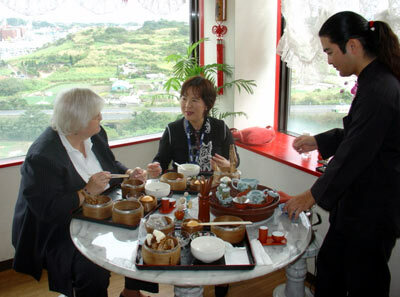 Few foreigners—and not too many more Okinawans—are aware of the opportunities to partake of Chinese teas here locally. We visit Yamucha Hatsusen Tei, a Chinese tea house, to absorb the Taiwanese style of tea appreciation. The Chinese style is not as somber as the Japanese tea ceremony, but the intensity and precision of preparation and execution are every bit as stringent. Hiroyasu Shinjo is our host at Yamucha, explaining each element of the preparation ceremonies as he performed them. A big plus for gaijin is that Shinjo speaks fluent English, making the event much more meaningful. 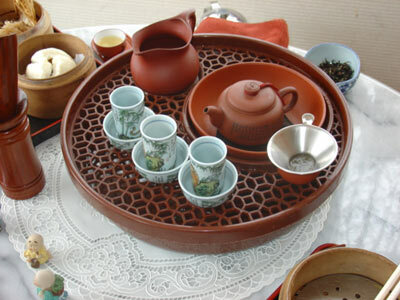 The Chinese tea ceremony begins with heating all tea brewing utensils, pots, cups and steeping cups. Carefully measured amounts of cut tea are placed in the warmed pot, then filled with water. A key element of tea brewing, says Shinjo, is that the first pot of water to cross the leaves is tossed out, not for drinking. Subsequent pots brewed are for drinking, with quality leaves yielding as many as 7-8 pots of tea. The aroma of a quality tea is as important as the taste itself, according to tea experts. As it’s brewed, then placed in the small Chinese cups, the flavor accumulates. As the tea drinker inverts the cup to release the tea, the first essential moment is to savor the aroma. Each Chinese tea has a different scent. The tea ceremony can be enjoyed unto itself, or can be a part of a tranquil luncheon at Yamucha. A luncheon set goes for ¥1,050, and includes soup, salad, and a variety of steamed filled manju. The dessert manju is from mango, and is absolutely fantastic. Dinners at Yamucha are ala carte, with 49 menu items available. A picture menu is available, and of course, Shinjo is available to assist with explanations of the fillings. Included are custards, rice, meats, banana, shrimp, scallops, mixed seafood and seseme. Yamucha is open daily except Mondays, 11am ~ 11pm. Friday and Saturday the tea house stays open an extra hour, to midnight. Yamucha Hatsusen Tei Teahouse is relatively easy to find, although the driver or navigator must pay attention in looking for the signs. Travel south on the Expressway, exiting at Nishihara, exit 2. Proceed south on Highway 330 to Route 241, the street where the American Consulate Naha is located. Turn left onto 241, then proceed east past the Consulate toward Shuri. You will travel approximately four kilometers before a major intersection / traffic light and signs to Nishihara. Proceed straight for about 150 meters, past an ornate Okinawa design bus stop with shishi and ceramic tile. Look carefully for yellow banners with red writing and trim. Turn left onto the small roadway, and Yamucha is about 50 meters down the road. Ample parking is just past the tea house on the right.